Before you begin the physician assistant program application process, you’ll want to create a basic timeline that you can refer to. This timeline will help you figure out which tasks need to be done by when, but it will also help you organize your application materials. Think of your timeline as a master schedule- it’ll help keep you on top of the application process and plan for the unexpected. Applications are usually submitted a year prior to attending, but you’d be surprised how quickly a year can fly by! Applying early helps you avoid those unexpected delays, allows for processing time, and may even improve your chance of admission to programs that utilize rolling admissions. Below is a basic breakdown for the PA program application process. Keep in mind that we’ve broken up our timeline into two major chunks: before and during the application process. You may want to create a more detailed monthly schedule or a Google calendar to better keep track of your application progress. This will help you read about the application process directly from the source, even if you’re not applying until a later application cycle. It also allows you to be updated with any changes to CASPA or current events related to the PA profession. The PAEA Program Directory is a great place to start, but there are plenty of other ways to search for your ideal program. If you’re still in school, find a time to talk about your plans to apply to PA programs. You’re already paying for access to advising personnel, so take advantage of this resource while you have it! If your undergraduate major was in a non-related field, take any prerequisite courses you may be missing. Doing this will boost your resume and help outline your key qualities. Things like joining an active student organization, doing volunteer work, or participating in research opportunities are all great ways to show that you’re a motivated leader capable of teamwork. If your ideal program requires the GRE/MCAT/TOEFL or any other standardized test, give yourself adequate time to prepare and take the tests. You may find that you need to take the test multiple times to get the scores needed for admission, so don’t let this delay your application process. Make sure to include a section for notes such as tuition, program class size, area of focus, etc. You’ll need to order transcripts using CASPA’s transcript request form at least one month prior to the earliest program deadline. You should also consider getting an additional copy to keep for your records. It’s never too early to start thinking about your letters of recommendation. Ideally, at least 2 of your recommenders should be supervisors from your time spent accumulating healthcare experience hours. It’s also a good idea to have a backup recommender (remember- expect the unexpected!) Also, be sure to secure their commitment to writing you recommendations before moving forward. CONTINUE ACCUMULATING HCE WHILE YOU WAIT! You can never have enough healthcare contact experience, so racking up more over the course of the application process will do nothing but benefit you. The more time you spend practicing and internalizing your answers, experiences, and anecdotes, the easier life will be on interview day. Run over the questions alone, gather anecdotes and experiences that relate to the PA profession, and have mock interviews with friends and family. If public speaking makes you nervous, start working through this anxiety and find ways to cope. This can take up to one month to be verified, so you’ll want to do this as early as possible. You’ll want to make absolutely sure you know all of the deadlines for the programs you’ll be applying to. Some programs may end up extending their deadlines depending on the amount of applications they receive, so check monthly for updates. Confirm that your letters of reference have been received. Once this has been confirmed, print a copy of all application materials for your records. Some have early deadlines and are not tied to a specific program, so do your research early on to avoid missing deadlines. You’ll want to make a decision on whether or not you’ll attend an interview immediately after you are asked. When in doubt, always accept – it’s better to keep your options open until you can make a more informed decision. And, of course, write and submit your PA School Narrative and any supplemental applications! Once your interviews have ended, send a thank you note to each school. If there were 3 or fewer people on your interview committee, write one for each individual member. If your committee was larger, you can write a single thank you note addressed to the entire committee. Once you’ve accepted a seat in your desired program, do a victory dance… and then make sure you contact the school’s Financial Aid office to start your financial aid process! If you want a second set of eyes, you may as well ask a Physician Assistant who has already gone through the process – and who has also been on the admissions board for the Rutgers PA Program! If your interview skills need polishing, we can help – remember, the best way to avoid jitters is to be confident through preparation! 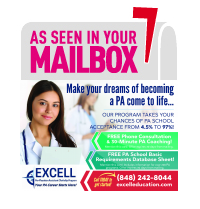 Our program works – 100% of our program graduates have gotten into PA school, and we can help you too! If you’re ready to jump right in, apply today – admissions are on a rolling basis, so early applicants are more likely you are to secure one of our competitive spots!